This tutorial will show you how to build a slide-out navigation panel, which is a popular alternative to using a UINavigationController or a UITabBarController that allows users to slide content on or off screen. The slide-out navigation panel design pattern lets developers add permanent navigation to their apps without taking up valuable screen real estate. The user can choose to reveal the navigation at any time, while still seeing their current context. In this tutorial you’ll take a less-is-more approach so you can apply the slide-out navigation panel technique to your own applications with relative ease. You’re going to build a slide-out navigation panel into a cute kitten and puppy photo browser. To get started, download the starter project for this tutorial. It’s a zip file, so save it to a convenient location and then extract it to get the project. CenterViewController: The center panel. You can replace it with your own view controller (make sure you copy the button actions). SidePanelViewController: Used for the left and right side panels. This could be replaced with your own view controller. The views for the center, left, and right view controllers are all defined within Main.storyboard, so feel free to take a quick look to get an idea of how the app will look. Now you’re familiar with the structure of the project, it’s time to start at square one: the center panel. In this section, you’re going to place the CenterViewController inside the ContainerViewController, as a child view controller. Open ContainerViewController.swift. At the bottom of the file there’s a small extension for UIStoryboard. It adds a few static methods which make it a bit more concise to load specific view controllers from the app’s storyboard. You’ll make use of these methods soon. Note: These are implicitly-unwrapped optionals (as denoted by the !). They have to be optional because their values won’t be initialized until after init() has been called, but they can be automatically unwrapped because once they’re created you know they will always have values. The code above creates a new CenterViewController and assigns it to the centerViewController property you just created. It also creates a UINavigationController to contain the center view controller. It then adds the navigation controller’s view to ContainerViewController‘s view and sets up the parent-child relationship using addSubview(_:), addChildViewContoller(_:) and didMove(toParentViewController:). It also sets the current view controller as the center view controller’s delegate. This will be used by the center view controller to tell its container when to show and hide the left and right side panels. You’ve created your center panel, but adding the left view controller requires a different set of steps. There’s quite a bit of set up to get through here, so bear with it. Think of the kittens! To expand the left menu, the user will tap on the Kitties button in the navigation bar. So head on over to CenterViewController.swift. As previously mentioned, the method is already hooked up to the Kitties button. This uses optional chaining to only call toggleLeftPanel() if delegate has a value and it has implemented the method. You can see the definition of the delegate protocol in CenterViewControllerDelegate.swift. As you’ll see, there’s optional methods toggleLeftPanel() and toggleRightPanel(). If you remember, when you set up the center view controller instance earlier, you set its delegate as the container view controller. Time to go and implement toggleLeftPanel(). Note: For more information on delegate methods and how to implement them, please refer to Apple’s Developer Documentation. This will let you keep track of the current state of the side panels, so you can tell whether neither panel is visible, or one of the left or right panels are visible. The current state is initialized to be .bothCollapsed – that is, neither of the side panels are visible when the app first loads. The leftViewController property is an optional, because you’ll be adding and removing the view controller at various times, so it might not always have a value. First, this method checks whether the left side panel is already expanded or not. If it’s not already visible, then it adds the panel to the view hierarchy and animates it to its ‘open’ position. If the panel is already visible, then it animates the panel to its ‘closed’ position. The code above first checks to see if the leftViewController property is nil. 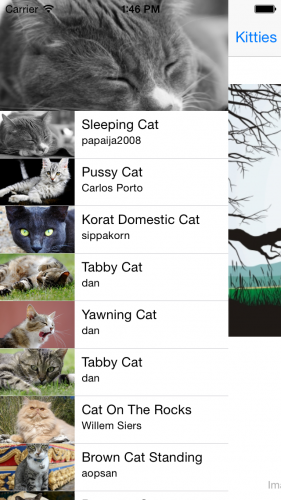 If it is, then creates a new SidePanelViewController, and sets its list of animals to display – in this case, cats! This method inserts the child view into the container view controller. This is much the same as adding the center view controller earlier. It simply inserts its view (in this case it’s inserted at z-index 0, which means it will be belowthe center view controller) and adds it as a child view controller. It’s almost time to try the project out again, but there’s one more thing to do: add some animation! It won’t take long! This value is the width, in points, of the center view controller left visible once it has animated offscreen. 60 points should do it. This method simply checks whether it’s been told to expand or collapse the side panel. If it should expand, then it sets the current state to indicate the left panel is expanded, and then animates the center panel so it’s open. Otherwise, it animates the center panel closed and then removes its view and sets the current state to indicate it’s closed. This is where the actual animation happens. The center view controller’s view is animated to the specified position, with a nice spring animation. The method also takes an optional completion closure, which it passes on to the UIView animation. You can try tweaking the duration and spring damping parameters if you want to change the appearance of the animation. OK… It’s taken a little while to get everything in place, but now is a great time to build and run the project. So do it! When you’ve run the project, try tapping on the Kitties button in the navigation bar. The center view controller should slide over – whoosh! – and reveal the Kitties menu underneath. D’aww, look how cute they all are. This adjusts the opacity of the navigation controller’s shadow to make it visible or hidden. You can implement a didSet observer to add or remove the shadow whenever the currentState property changes. The didSet closure will be called whenever the property’s value changes. If either of the panels are expanded, then it shows the shadow. Build and run the project again. This time when you tap the kitties button, check out the sweet new shadow! Looks better, huh? The code above is almost an exact duplicate of the code for the left panel, except of course for the differences in method and property names and the direction. If you have any questions about it, review the explanation from the previous section. Just as before, the IBActions and IBOutlets have been connected in the storyboard for you. Similar to the Kitties button, the Puppies button is hooked up to an IBAction method named puppiesTapped(_:). This button controls the sliding of the center panel to reveal the right-side panel. The kitties and puppies are listed within the left and right panels. These are both instances of SidePanelViewController, which essentially just contain table views. Head over to SidePanelViewControllerDelegate.swift to take a look at the SidePanelViewControllerdelegate method. A side panel’s delegate can be notified via this method whenever an animal is tapped. Let’s use it! If there’s a delegate set, this will tell it an animal has been selected. Currently there’s no delegate yet! It would make sense for CenterViewController to be the side panel’s delegate, as it can then display the selected animal photo and title. This method simply populates the image view and labels in the center view controller with the animal’s image, title, and creator. Then, if the center view controller has a delegate of its own, you can tell it to collapse the side panel away so you can focus on the selected item. The switch statement in this method simply checks the current state of the side panels, and collapses whichever one is open (if any!). That should do it! Build and run the project again. View kitties or puppies, and tap on one of the cute little critters. The side panel should collapse itself again and you should see the details of the animal you chose. The navigation bar buttons are great, but most apps also allow you to “swipe” to open the side panels. Adding gestures to your app is surprisingly simple. Don’t be intimated; you’ll do fine! Note: Refer to our Using UIGestureRecognizer with Swift Tutorial for more information about gesture recognizers in iOS. Didn’t I tell you it’d be simple? There’s only one move remaining in your slide-out navigation panel routine. The gesture recognizer calls handlePanGesture(_:) when it detects a gesture. So your last task for this tutorial is to implement the method. .began: If the user starts panning, and neither panel is visible then shows the correct panel based on the pan direction and makes the shadow visible. You can move the center view around, and show and hide the left and right views using a combination of these three states, as well as the location and velocity / direction of the pan gesture. Build and run the program again. At this point, you should be able to slide the center panel left and right, revealing the panels underneath. If everything is working... you're good to go! Congratulations! If you made it all the way through, you're a slide-out navigation panel ninja! I hope you enjoyed this tutorial. Feel free to download the completed project file. I'm sure you'll enjoy being stuck in the middle of kitties and puppies!